You can best describe the water-loving Chesapeake Bay Retriever temperament as friendly, courageous, and intelligent. Chesapeake Bay Retrievers – also known as Chessies – are one of the few breeds originating from the United States; Maryland to be exact. The breed descended from of two Newfoundland pups, Sailor and Canton. Traveling on a ship from England in 1807 the crew and the dogs survived a wreck. Sailor, a red male, went home with John Mercer from West River. And Canton, a black female, went with Dr. James Stewart from Sparrow’s Point. The two dogs quickly gained a reputation as great water dogs, especially in duck hunting. Their offspring were no different. There is no record of Canton and Sailor mating. However, DNA strains from both western and eastern Maryland shores were recognized seventy years later. The similarities were there so the breed was officially recognized as “The Chesapeake Bay Ducking Dog” in Baltimore in 1877. When the American Kennel Club was founded in 1884, a definitive Chesapeake Bay Retriever was developed. The breed became famous for its inherent ability to navigate through the Chesapeake Bay’s icy, rough waters. And the official American Chesapeake Bay Club was founded in 1918. Retrievers have an upbeat, loyal, and affectionate disposition. The Chesapeake Bay Retriever is known for their tenacity and toughness. Chesapeake Bay Retrievers tend to be more protective and less friendly with strangers than their sporting dog counterparts. But, with their family, Chessies are happy and loyal. Chesapeake Bay Retrievers have a mind of their own. This is a breed that does what they want, how they want. But, they are ultimately big softies who respond well to positive reinforcement training. This brave breed is willing to please and love to be around their humans. But, that doesn’t mean they are needy. Chessies are not demanding of attention and can be perfectly happy hanging out by themselves. Chesapeake Bay Retrievers are affectionate and loving, meaning they are good with children. But, because of their protective nature, may not do well with children under eight. They are also good with other dogs and even cats if properly socialized or raised with them. However, they will probably chase any other cat. The Chessie can be stubborn and willful. Inexperienced or new dog owners will find life easier with another dog breed. Training a Chesapeake Bay Retriever needs to start early, or you’ll find yourself with a rowdy, tenacious Chessie. This is a breed that requires firm, consistent training by everyone in the household. Avoid letting your Chesapeake Bay Retriever do something “just one time” or you’ll spend too much time retraining them. Chesapeake Bay Retriever training works best with positive reinforcement. Though they are willful and persistent, they are sensitive and do not respond well to harsh training or punishment. Chessies are serious workers and are known for their excellent memory and vision. So, once the Chesapeake Bay Retriever learns something, they’ll remember it. Be respectful of their learning ability. Don’t bore them by trying to drill the same command over and over when it’s clear they know what to do. A good outlet for Chesapeake Bay Retrievers is hunting – specifically, duck hunting. Giving them a job to do will help with training and keep their minds sharp. Give this great online training resource a try out if you are in need of a Do It Yourself guide. Ready to add a Chesapeake Bay Retriever to your family? 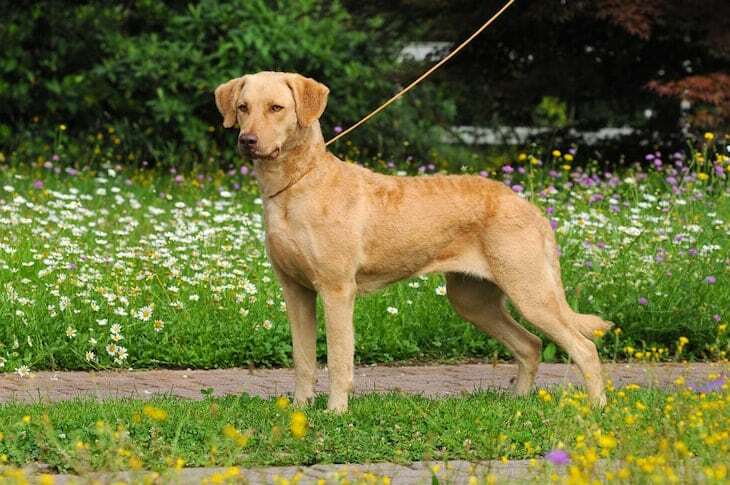 Finding the perfect Chesapeake Bay Retriever for sale will take time and research. First, are you looking to go the breeder route? Or, are you thinking about Chesapeake Bay Retriever adoption from a rescue or shelter? Regardless of whether you are purchasing your Chessie from a breeder or adopting one from a shelter or rescue, the Chesapeake Bay Retriever price will be a factor. The average price for purebred Chesapeake Bay Retriever puppies is around $825.00. But can range between $1,300 to $5,500 depending on whether the litter is of a top breed line or superior pedigree. 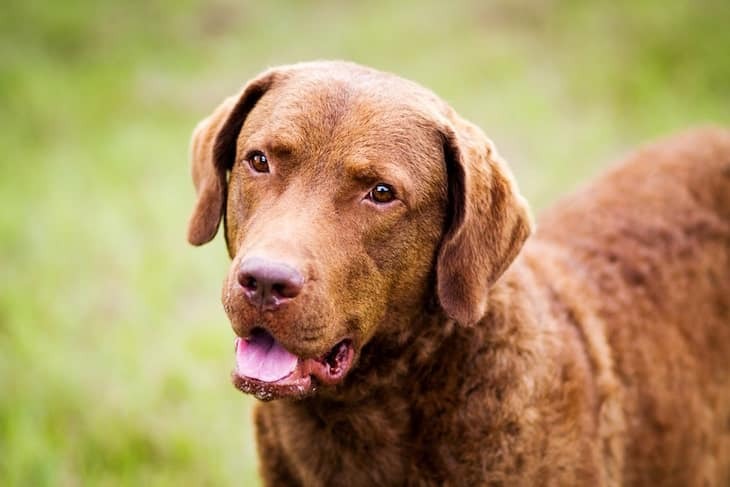 If you are looking to adopt a Chesapeake Bay Retriever, the Chesapeake Bay Retriever Relief & Rescue is a great place to start. Not only do they provide information on the breed, but they also lay out the adoption process and feature adoptable dogs. Another Chesapeake Bay Retriever rescue option is contacting your local rescue or shelter. While they may not have purebred Chesapeake Bay Retrievers for adoption, they could have mixes available. Additionally, they may have adult Chessies for those who do not want a puppy. When you are dealing with a shelter it's good to know how to determine if the shelter's dog's temperament is intact. Here are tips that help you do just that. 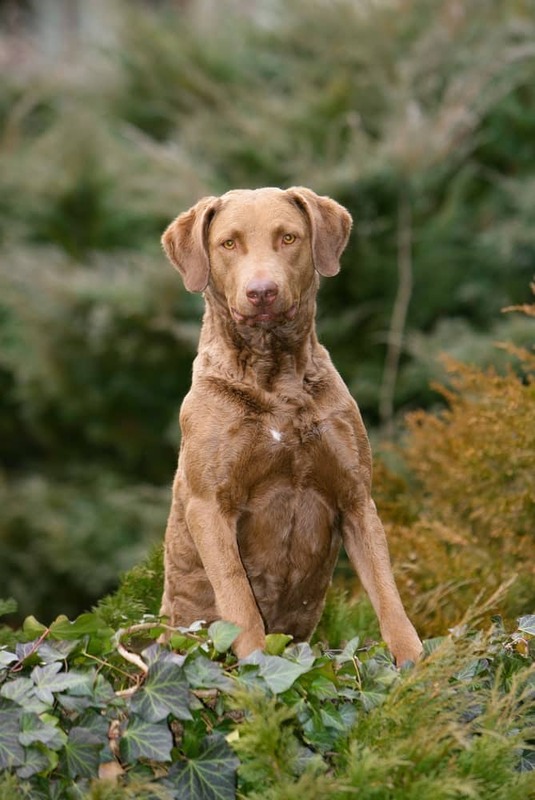 Choosing quality Chesapeake Bay Retriever breeders can be a challenge. Good breeders will be able and willing to answer your questions about temperament, health, and personality of their Chessie litter. A quality breeder will be able to tell you the history of the breed and discuss potential health and temperament issues associated with the breed. To find Chesapeake Bay Retrievers puppies for sale, check out the AKC Marketplace, which has information on the breed as well as a breeder directory to help you find the perfect breeder. The American Chesapeake Club is another great resource for finding a reputable Chessie breeder. The Chesapeake Bay Retriever size is medium, ranging between 21-26” and weighing between 55-80 pounds. Their life expectancy is between 10-13 years. Because the Chesapeake Bay Retriever’s entire purpose is water retrieving, their coat is water resistant. The Chessie’s top coat is short, thick, and oily while the undercoat is dense, fine, and woolly. The two coats provide insulation that allows them to hunt in snow and icy conditions. Chesapeake Bay Retrievers are heavy shedders. They require weekly brushing to help remove dead hair. Note: Over-bathing will strip them of their protective oils and destroy their coat’s water resistance. So keep bathing to a minimum. Here are 10 key steps to follow when Grooming your dog. Note: Have no fear. Many dog breeds are susceptible to these health problems. As a dog parent, you play a key role to ensure your dog stays healthy, don't suffer from these diseases and live out a full life. Take a look at The Ultimate Guide to Dog Health now. It will help you do just that. And your canine pal will love you for it. The best form of exercise for Chesapeake Bay Retrievers is swimming. Letting them swim and retrieve in the water for hours will make for one happy Chessie. Chessies do require a good amount of exercise and do not make great apartment dogs. If they don’t get exercise, they can become bored and destructive. Read here to learn how exercise can help dogs overcome bad behaviors. Daily walks or jogs (if you can’t take them swimming) are perfect. The Chesapeake Bay Retriever temperament can be a handful for new or inexperienced owners. However, they are still loyal, affectionate, and obedient breed. Put a Chesapeake Bay Retriever near water and you’ll have trouble getting them out! This is a breed that loves to swim and retrieve. They love humans but do not demand attention. They make great watchdogs and can get along with kids and other dogs when supervised. With the proper training and socialization, the Chesapeake Bay Retriever will make an amazing family companion.